I keep telling myself I am going to catch up on these pictures – but I still haven’t. 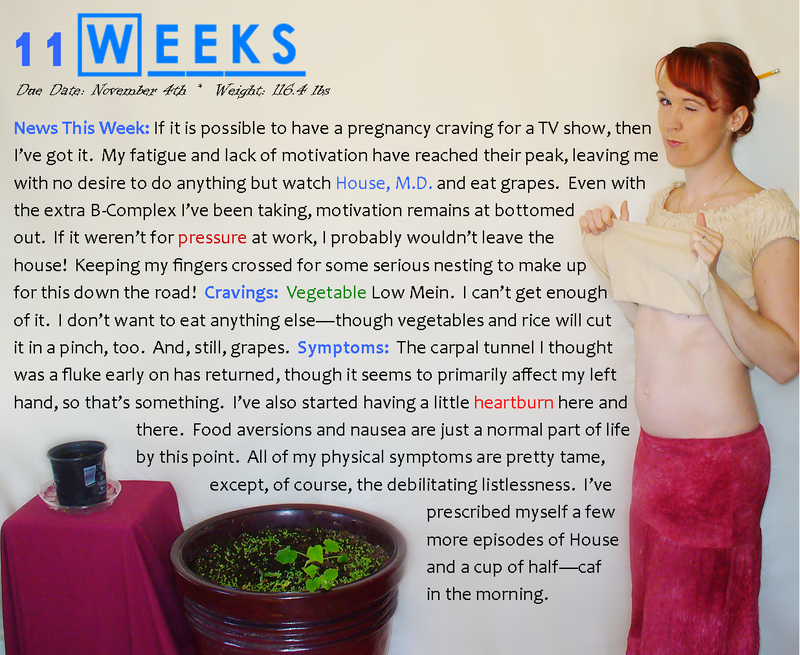 I am 13 weeks pregnant, and have just added the text to the 11 week photo. I’m starting to see a little bit of belly most of the time. Not something else I would expect anyone else aside from MacGyver to notice, but I can see it. And still, I have a hard time fitting food in. Every time I eat a meal I get uncomfortably full very fast, and my belly suddenly sticks out a lot more. On a random note, that is a pencil in my hair, and there is a pen on the other side. This became one of my favorite hair styles when I was in college because 1) it is super quick and easy, and 2) it allows me to do the spicy librarian hair let down (pull out the pencils, and shake out the hair into loose wavy curls). We spent Easter weekend at my mom’s house, and it was so wonderful. We had so much fun, and there will be a bit more on that attached to the 12 week photo (if I ever get around to it!). This entry was posted in Pregnancy Photography and tagged 11 Weeks Pregnant, baby bump, first trimester cravings, first trimester symptoms, maternity photography, pregnancy fatigue, pregnancy ideas, pregnancy listlessness, pregnancy memory project, vegan pregnancy cravings. Bookmark the permalink.